When considering a shrub for the landscape it is worthwhile to note the plants characteristics throughout the year. During the design process, landscape designers often rely too heavily on the evergreen layer to create interest in the winter landscape. One of the most frequently asked questions by our clients is "how does the plant look in the winter?" While evergreens do provide green in the off season, there are also deciduous shrubs that offer interest in other ways. Here in Lancaster Pennsylvania, the five shrubs listed below hold their own in at least three of the four seasons. Check them out, for consideration when you are planning your landscape, or simply looking for something interesting to plant. The variety 'Jalena' with fragrant half burnt orange flowers mid February in Lancaster Pa. Strong horizontal habit. Excellent yellow-orange-red fall color. 'Diane' is a great deep bronze red flowered variety with a slight fragrance. Fall color is often tri colored with red-orange and yellow. 'Arnold's Promise' One of the oldest and best cultivars for fragrant yellow flowers. Heavenly Bamboo is not a true bamboo but simply has the upright habit and a leaf similar to many bamboos, hence the common name. By no means is this plant a runner like many bamboos, instead ot forms a fairly narrow plant up to 8' high in south central Pennsylvania although plants in the 5' range are more common. Nandina can be tardily evergreen depending on the severity of the winter weather, particularly with regard to cold temps. Even with the recent visit from the polar vortex a plant on the south side of our home remains full in leaf and berry. The berries are great for use in decorations during the holidays and persist for a long time once cut. The variety 'Fire Power' makes a good ground cover. 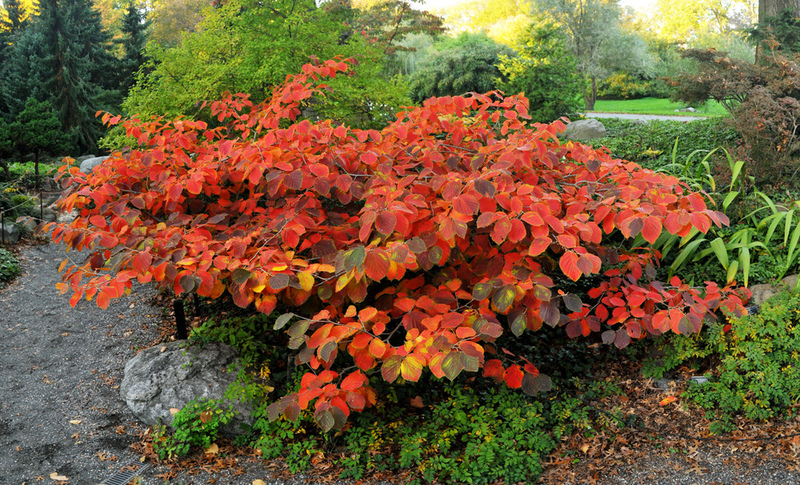 Prune back the stems in late winter to create the most vibrant color display. The numerous variety and cultivars range in size from 2 to 10 feet tall and wide. 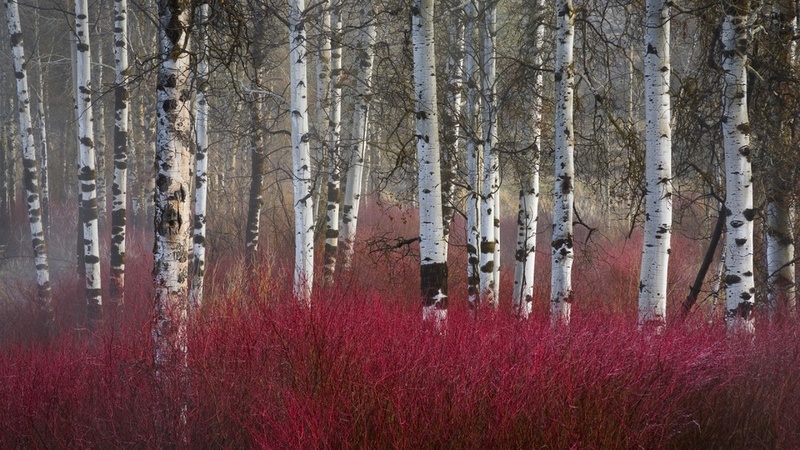 Red twigs among a grove of Aspen. Winterberry in a low lying area in Lancaster County with a foreground of Little Bluestem. Winterberry at Longwood gardens in Kennet Square Pa. The only evergreen to make the list, Mahonia is a functional broadleaf with leathery and spiny leaflets. The shrub offers a nice alternative to those who want something other than a Rhododendron. The lemon yellow flowers open in March and remain effective for 4 to 6 weeks. Flowers are wonderfully fragrant and attract early pollinators. Blue egg shaped fruit follow.